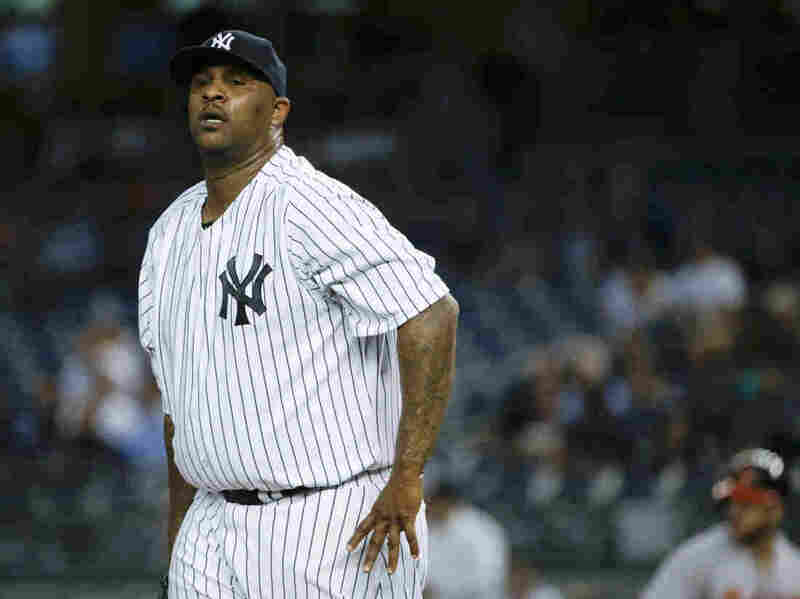 Yankees Pitcher CC Sabathia Will Enter Alcohol Rehab And Miss Post-Season : The Two-Way A day before the New York Yankees face the Houston Astros in the American League wild card game, CC Sabathia announces that he is entering rehab to get the help "needed to treat my disease." New York Yankees pitcher CC pictured here during a Sept. 9 game against the Baltimore Orioles in New York. Sabathia announced today he will enter alcohol rehab and miss the playoffs. The 35-year-old Sabathia was not scheduled to pitch in Tuesday's wild-card game, but if the Yankees advance to the American League Division Series, he likely would have been in the rotation. This season, Sabathia has a 4.73 ERA and 6 wins, 10 losses in 29 starts. Statistically, the 2015 season was one of the worst in Sabathia's 14-year career, although he had been improving lately. He ended September with 2.25 ERA and in his most recent game on Oct. 1, he led the Yankees to a 4-1 win over the Boston Red Sox, pitching 5 innings and giving up one run. According to ESPN, Yankees general manager Brian Cashman said he was informed of Sabathia's decision "via an 'unexpected' phone call with the pitcher and others." "CC has demonstrated a great deal of courage in trying to tackle this problem," Cashman said. "Time and place have no bearing. There is something here that needs to be taken care of and I applaud him." "What CC is dealing with is a life issue," Cashman said. "It is bigger than the game [Tuesday] night."